Hello out there in Blogland!! Since Blogger was down from Thursday until Friday afternoon...Frugal Friday went live this week without my Frugal Round-up. But never fear! I am not one to pass by a Frugal Round-up - after all, the inspiration is what linkies are all about, right? 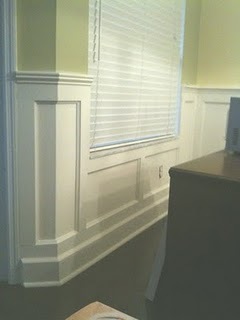 First up, I Design shared her uber-fabulous DIY wainscoting. I simply adore it! Next, Inspired By You shared her lovely reupholstered settee. Brown velvet....mmmmmmmm. Three Pixie Lane shared an adorable vintage party hat tutorial. And while we're on the subject of adorable, vintage parties...check out this darling 1st birthday party by The Tomseth﻿ Family. I just love children's birthday party inspiration! The winner of the Lisa Leonard gift certificate is Kim Webb! The winner of the Picaboo Gift Card is Leslie from Nobody Gave me the Instruction Booklet! And the winner of the Simplee Vinyl Gift Certificate is Jenny from L.O.T.s of Love! Frugal Friday is still going on...go ahead and link up your latest Frugal Inspiration post..you know you want to. Lovely features, the brown velvet settee looks amazing! Those party hats are so cute! Thank you so much for the feature of my party hats! I posted the party that I made the hats for and will link up this Friday! The whole blogger down thing threw me off!! Thank you! !